Put the ricotta in a fine sieve set over a bowl. Cover with plastic wrap and refrigerate overnight. Discard the liquid in the bowl. Wipe out the bowl, add the thickened ricotta and stir in 1 tablespoon of the olive oil and season with salt and pepper. Preheat a grill pan. Lightly brush both sides of the bread slices with oil and grill, turning once, until toasted, about 3 minutes. Transfer the toasts to a platter and rub them with the whole garlic clove. In a small bowl, toss the red onion with 2 tablespoons of the balsamic vinegar and let stand for 10 minutes; drain the onion, discarding the vinegar. Meanwhile, in a small saucepan, boil the remaining 1/4 cup of balsamic vinegar until reduced to 1 tablespoon, about 5 minutes. In a medium skillet, combine the remaining 2 tablespoons of oil with the minced garlic, chorizo, tarragon and parsley. Cook over low heat, stirring occasionally, just until warmed through, about 5 minutes. 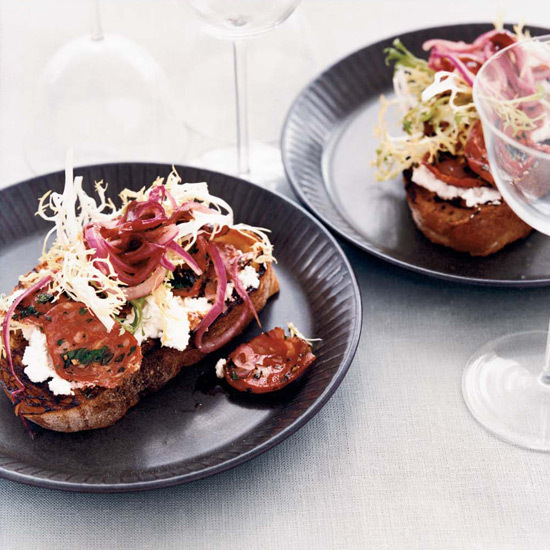 Spread the ricotta on the toasts and top with the warm chorizo. Garnish with the frisée and pickled onions. Drizzle with the reduced balsamic vinegar and serve. Pair spicy chorizo with a fruity red, like one from Greece's Nemea region, or a full-bodied white, such as a Chardonnay from Burgundy.